This impulse is evident in Lia Lowenthal’s EAF16 project, for which she has deconstructed a grand piano. Lowenthal builds upon our base understanding of a piano, but re-situates that with elements of a gothic cathedral. In doing so, she aims to investigate the social history of objects and represent those histories in an alternative way of interaction. Lowenthal’s installation at Socrates was influenced by the formal and conceptual relationship she has developed over time with the piano, elaborating on the idea of a traditional jewelry trunk show. Since the EAF16 opening, she has continued to explore new ways to integrate pianos in her practice. “When we think of a piano, we think of being indoors. 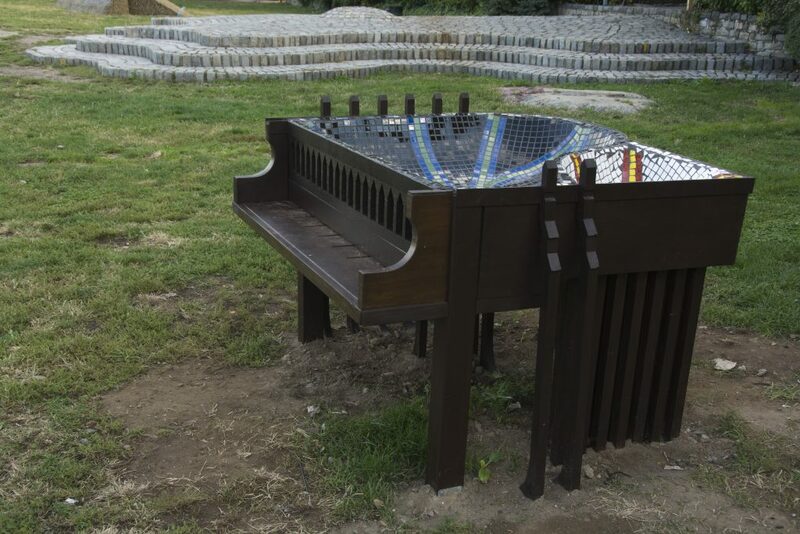 By placing Dilated Surpintel outdoors, I hope to contrast that instinct both emotionally and architecturally.” Lowenthal considers the fact that Socrates, like many sculpture parks, is a manufactured and orchestrated experience, and that viewing the piano as a manufactured object that orchestrates emotions made using it an easy choice.